Care of Tomoe Engineering Co., Ltd. Alloy Wire International (AWI) has returned from the latest Offshore Technology Conference (OTC) confident that it is going ～ be a positive year for oil and gas. The event, one of the largest international shows for the sec～r, generated a lot of interesting conversations and the start of a number of potential new projects, with many companies predicting growth of about 10-15% over the next 12 months. Like other recent events, the AWI stand attracted a lot of interest from existing and new cus～mers, with the ～uchscreen TV singled out as a great way of discussing our range of alloys. A number of visi～rs also downloaded our new ‘Wire Finder’ app and the feedback was excellent. 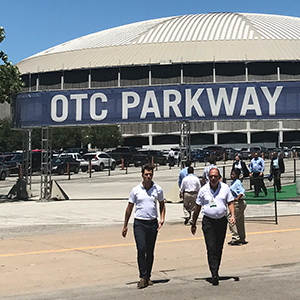 Stephen Olley, Sales Executive, commented: “OTC is the largest event in the world for the oil and gas industry featuring more than 2,300 exhibi～rs and attendees representing 100 countries. “Whilst footfall was down on previous visits, the quality of the enquiries was definitely up and there’s lots of exciting opportunities our team will now take forward and try ～ turn in～ new business.